Construction is desperate for good, experienced, skilled and dedicated supervisors and foremen. Being a construction supervisor or foreman is challenging, it’s hard work, but it’s also rewarding watching construction projects take shape under your watch. A foreman and supervisor’s job is never boring – every day is different, each construction project is different, different locations and different people, all presenting new challenges. A construction foreman, foreperson or supervisor, supervises a work crew, or manages a section of work on a construction project. They’re at the coalface of every construction project – the critical link in the production process. 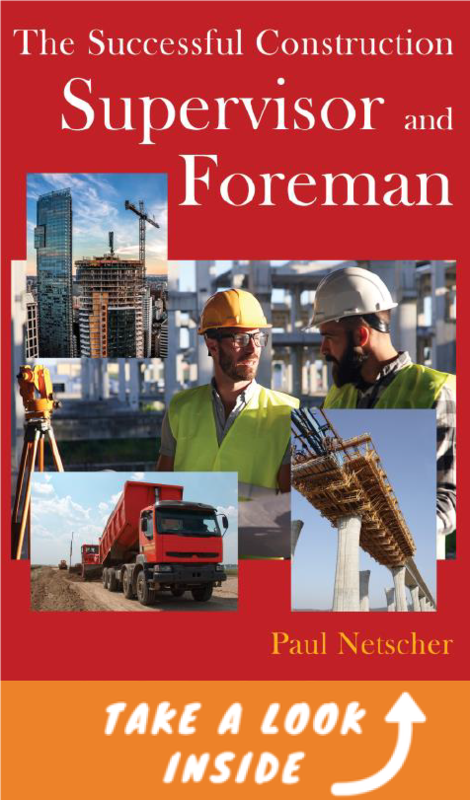 Good foremen and supervisors are essential to the success of every construction project and every construction company. They're responsible for safety, quality, productivity, people, equipment and more. Yet, few managers and supervisors are prepared to mentor and train the next generation of construction supervisors and foremen. Most construction supervisors have years of experience on the tools, learning their trade, sometimes through apprenticeships, but mostly learning from others and through experience. But, being a supervisor or foreman is a different ballgame. Where before, as a tradesperson you were doing the construction tasks, now as supervisor you must organise and manage others doing the construction work. As a young engineer and later as project manager on construction projects, I was fortunate to learn from many excellent supervisors and foremen. I wouldn’t have achieved what I did without the foremen on my construction projects. Now it’s my turn to share my 30 years of construction experience and knowledge with construction supervisors and foremen. Written by a construction professional. Easy to read. This is not a boring text book. Not specific to a country or field of construction so it can be used for any construction project anywhere in the World. Deals with practical everyday issues on construction projects. Learn how to better manage people and your construction crew. Understand the why, who and how of managing a construction project. Become a more effective manager. Contains valuable tips and advice to advance your construction career. Supervisor and foreman self-evaluation form included. Fishpond; loot.co.za, uread; bokus; OR OTHER RETAIL OUTLETS.